To ensure all players can participate with the release of the new classes, one additional character slot will be awarded for free. 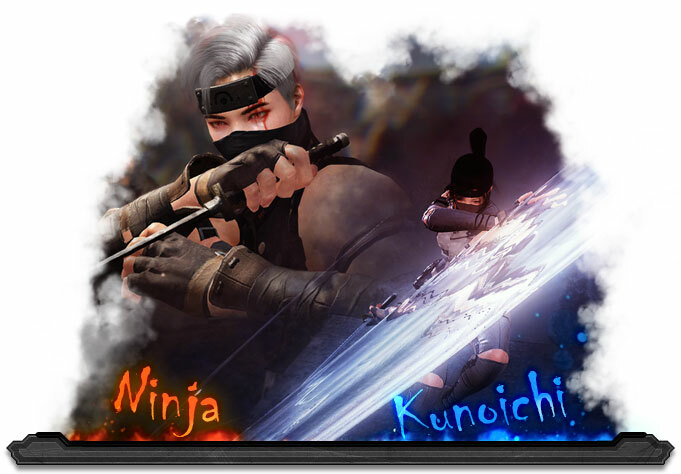 The “Skill Awakening System” will be revised and replaced with the “Skill Add-On System”, for more details click here. Golden Dagger Event has been started. o Golden Coelacanth Event has ended. Fun In The Sun - additional info >here<. Colors of Summer - additional info >here<. Fixed an issue where unintended kicks would be triggered by using the ability Ground Smash right after Sideways Cut. Fixed an issue where the damage was not always applied when using the ability “Slash X” directly after moving to the left or right. The amount of durability decrease has been slightly reduced. Damage done in PvP from the ability “Dark Flame” has been slightly decreased. Fixed an issue where the absorption of MP was not possible while using the ability “Shadow Riot” with 3 Shards of Darkness active. Fixed an issue where the damage of the ability “Ultimate: Fierce Strike” was lower than its description. Animation speed of the ability “Summon Heilang” has been increased. Animation speed of the ability “Absorbing Heilang” has been increased. Animation speed of failing to “Absorb Heilang” has been increased. Fixed the issue where Heilang breaks guard on abilities such as “Super Armor”. Basic and Skill attack AP for Heilang has been increased. Heilang will no longer attack first or counterattack when summoned for the 1st time. Heilang will no longer attack first or counterattack while under the commands: Follow, Stay, or Sit. Heilang will no longer use its combat skills when the Tamer uses their own skill while under the commands: Stay or Sit. Heilang will attack first or counterattack during as normal while under the command: Attack. Fixed the issue where jumping was still possible when weight was above 125%. Fixed an issue where the skill description of the ability “Punishment” included mounted combat. Key combination description has been added to ability “Sharp Light”. Using the skill of “Magic Lighthouse” will now immediately activate to aggro Monsters and decreases their DP. Aggro generation for using the ability “Magic Lighthouse” has been dramatically increased. Fixed the issue where Fireball Explosion could be learned without learning the ability “Fireball”. Hitting effect color of the abilities “Lightning Storm” and “Residual Lightning” have been changed. Fixed issue where the effect Explosive Hit was being applied late when using the ability “Absorb Mana” while on a mount. Damage of the ability “Concentrated Magic Arrow” has been decreased when used in PvP. The ability “Ultimate: Blind Slash” can be used through hotkey while mounted now. Fixed issue where “Arrow Grapple” could be used through hotkey. Fixed the issue where “Blooming” was not activated after learning “Blooming: Phantom”. Fixed the issue where cool down timer wasn’t reset when using the ability “Rising Storm” while mounted. Movement speed has been increased when using “Chase” skills with Blade or Tiger Blade. The ability “Blind Slash” can be used through hotkey while mounted now. Fixed issue where Arrow Grapple could be used through hotkey. Movement speed has been increased when using “Chase” with blade. Heating for Rare level or higher Accessory have been added. Added “Bleach” item to loyalty shop at the cost of 1 loyalty per, you may purchase a maximum of 20 of this item per Account. * This item will be available for a limited time only. Update: The Cokro Outfits were not included in this patch. The Night Vendor - Patrigio, has been added. Patrigio sells various black market items and is only accessible in the night hours. Viewing the goods sold by this vendor will consume 50 energy, for more information click here. The Day Vendor - Morco, has been added. Morco sells various tools, gems, and other items during the daylight hours. Viewing the goods sold by this vendor will consume 10 energy. Speaking with Morco will also provide players with hints on where to find his night counterpart Patrigio. Swimming animation has been altered when wearing Splat Fisher’s Clothes. Stamina consumption while swimming has been decreased. Swimming speed will be decreased by 30% when players stamina hits 0. Players will automatically float to the surface of the water when the Breath Gauge reaches 0 while diving. In the event a boat, rock, or other object is blocking the player’s path to the surface of the water, they may move horizontally until their path is no longer obstructed. Fixed the issue where the small drum stays on the boat when player is swimming while wearing it. Falling motion has been added when players fall from a great height. Camera shake effect has been decreased when the angle of camera is too low to the ground. Number of pets Players can have out increased to a maximum of 4. Buff icon for items introduced with the new “Skill Add-On System” have been added. Cooldown time will be indicated to the nearest tenth in tooltip descriptions. Fixed the issue where the word “Dyed” was indicated in Korean from item tooltips linked in chat. Level Up Guide will show up only when the player levels up in a safe zone or enters a safe zone. Fixed the issue where the balance of stored silver was displayed incorrectly in the inventory window after repairing equipment. Skill window now shows total skill points and amount of used points. [French] (F1) Help menu has been improved. Fixed issue where the animation for fishing did not stop when the durability of fishing rod had reached 0 while auto fishing. HP gain on hit for Giants Fierce Strike still not working after you take our HP gain on hit? please start releasing the patch notes when you put them up instead of making us wait 4 hours. Listening to 1v1ers again and nerfing sorcs. Thanks for the warrior buff guys!!!! "Heating for Rare level or higher Accessory have been added." You're all so good to me. Yay! 4 pets can be out now! Thanks!